In celebration of Australian Football legend Lou Richards' immense contribution to the game, and continued services to the sport through his successful media career, the Slattery Media Group is thrilled to publish an updated edition of Lou's memoirs, first released in 1989. With a foreword by Eddie McGuire and a new section looking at the star's major achievements, and 16-pages of photography, My Wonderful Life is a stunning testimony to one of the game's true greats. It all started in 1940, when Lou's uncle Alby Pannam introduced him to Collingwood. After a best on ground performance in the Reserves Grand Final that year, senior coach Jock McHale approached Lou to congratulate him: "Well played today, son. You'll be a Collingwood player." Over his 15-year, 250-game career the courageous rover captained the club for four years, kicked 452 goals and was twice the runner-up in the Copeland Trophy, he also represented Victoria in 1947 and 1948. It was as a captain that Lou made his greatest impact on the club, especially in 1953 when he lead his team to the Premiership. 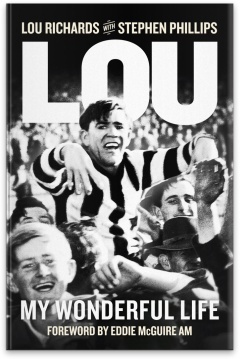 Respected by players and loved by fans, Lou Richards' legacy will never be forgotten–follow his rise to glory with this compelling memoir. Read a story on Lou Richards in the Herald Sun. Watch a story that appeared on The Footy Show for Lou's 90th birthday. Read a review that appeared in the Barossa Light Herald. Read a review from the Casterton News.